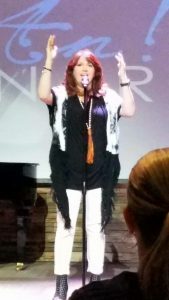 St. John’s GIFT Women’s Ministry hosted comedian Anita Renfroe, Oct.1 in the Faith Center. Traveling with her Mother-in-law, Kay, Anita drove up that day from her home in Atlanta, after flying home from Arizona the night before. Close to 250 women, ranging from age 14 to 86, along with a few brave men, enjoyed an afternoon of laughter and fellowship. Women came from all over. Winston Salem, China Grove, and Charlotte were all represented. Catawba students, Hannah Addair and Destiny Stone, led worship at the beginning of the program. 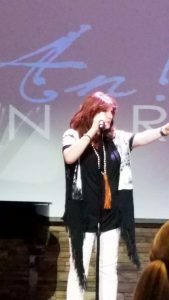 Anita began the event with her famous, “Mom Song,” but not before poking fun at the audience. Women in attendance all know who Constance is and just how important those seats in the front row can be. Lauren Stephenson, GIFT program director, said she felt like she was in a comedy club. Anita didn’t just perform her routine; she also played off the audience. Throughout the afternoon, no individual or age group was off limits as the target of a joke. We experienced it together as a community of women. Anita proudly shared her gift of Parody with the audience, and had the whole place connected through shared experience and laughter. When asked what Salisbury was known for, the crowd proudly responded “Cheerwine” and “Food Lion;” Celia Jarrett made sure that Anita Renfroe had a chance to try some Cheerwine before the afternoon came to a close. Before the event was over, Anita recognized the true heroes in the audience, the women who have overcome or are battling breast cancer. As a ministry, GIFT seeks to reach women in the community, extending outside the walls of St. John’s. This event accomplished just that. It was a great afternoon of unity in the Church. Guests from different denominations came together as women and believers. In the week following the concert, St. John’s felt the gratitude of women in the community, receiving “thank you” notes from different church groups in attendance for opening the event up to the public for free. Additionally, the love offering raised over $1000 for the GIFT Ministry. Anita provided a Sunday afternoon break for women in attendance, while successfully embarrassing the few men in the audience. Be sure to check the bulletins and FaithLife emails for more upcoming GIFT events you won’t want to miss out on.